The Walking Dead mid-season finale was a tense-filled chapter that finally introduced the main players to the threat of The Whisperers even as they lost one of their own. So we bid farewell to Jesus. (It’s still weird to refer to him even if he has been around for a few seasons). It wasn’t much of a shock given how the signs had been there for his departure based on his scenes in the last few episodes. At least we got to see him in action one last time and his defeat came at the hands of a terrifying new villain and not some random walker attack. Last episode was a quiet lead in to this one. It wouldn’t be a mid-season finale of The Walking Dead without a casualty and since Rick is still alive and well somewhere, someone had to fall. Besides, it was a great way to bring characters together as Daryl, Aaron, and Jesus went in search of Eugene, soon followed by Michonne and the new group of survivors. Rosita warned them all of the different kind of danger they faced and for a while they all did believe that the walkers had evolved to the point of being able to speak and to consciously fight humans. It was a chilling moment when the walker dodged Jesus’ attack and used his momentary shock to stab him in the back. Speaking of Negan, we see that he’s been having some kind of therapy sessions with Gabriel for some time, and he’s been enjoying himself as he annoyed the old priest. One reviewer pointed out that he and Gabriel had better chemistry together than Gabriel and Rosita because of their shared history. Negan goads Gabriel until the latter storms off and maybe carelessly leaves Negan’s cell door open. Security must be lax and maybe people believed that Negan is no longer a threat. But the smirk he gives when he realizes he can walk out of his prison proves that it maybe wasn’t the best idea to keep him alive all these years. The worst part of the episode was Henry’s arc, from his pointless pining after Enid to his hanging out with a bunch of delinquent teens from the Hilltop. To his credit, at least he was not on board with them keeping a pet walker for fun, having seen his fair share of bloodshed and mayhem. But the time spent on his scenes was really screen time that would have been better spent on more important things. I mean it basically established that teenagers are the worst, especially those who grew up in a protected compound like Hilltop. The lack of discipline instilled in them and their lack of exposure to the horrors of The Walking Dead is an affront to all those who struggled to survive. 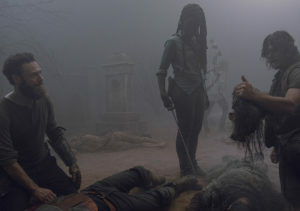 Another mystery is what tough choice Michonne made that turned everyone cold towards her. The people at the Hilltop weren’t very welcoming to her and there was some awkwardness between her and Carol. There is still so much of last few years that has not been revealed that may clarify why there is tension between communities that had previously been united. 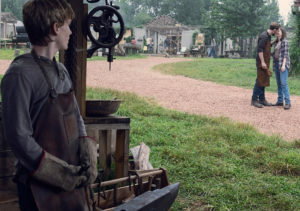 Later on, Daryl unmasks one of the Whisperers and the group discovers that they were fighting against people dressed up as walkers, a threat they had never encountered in all their years of surviving. I have to say that these new villains are way more intriguing because of the mystery and horror surrounding them as opposed to Negan and the Saviors’ blatant brutality. It’s an interesting point to cap the first half of the season and to keep us curious enough about what happens next on The Walking Dead.